Many golfers will agree that the secret behind playing golf at a professional level lies in the player’s ability to naturally shift their weight while swinging the golf club. That being said, golf release aids allow for instant feedback the minute the club has been swung and after some time practicing with it, you will begin to notice an improved swinging speed brought together with a greater distance travelled by your golf ball. Due to simple yet effective design, these tools can be used while indoors or outdoors. Swinging it will give the user the ability to sense the right swing method that will improve their game. Check out the best available golf release aids and training gear below. 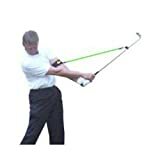 McLean Release The Jim McLean Release training club will help golfers from every level as they swing the weighted trainer with the unique bend in the shaft, allowing for the perfect release. Features: * Weighted club with bend in the shaft * Allows for proper pronation * Face-balanced for great function * Training grip If you have any questions about this product or would like to order by phone, please call us Toll Free at 888-733-8383. We look forward to hearing from you!